Olive oil is the most quintessential Mediterranean ingredient – it certainly makes me think of summer, eating al fresco. I love to slosh it on salads, coat my roasted veggies in it, and also – bake with it! This cake serves as a perfect, sumptuous and easy treat to make for any guests that are lactose intolerant. Olive oil is amazingly versatile; it can even be a delicate and fragrant alternative to butter in cakes and scones. It’s a serious superfood, packed full of anti-oxidants and good fats. Lemons also are bursting with vitamin C, and rosemary is renowned for its digestion-improving and memory and concentration-boosting qualities. 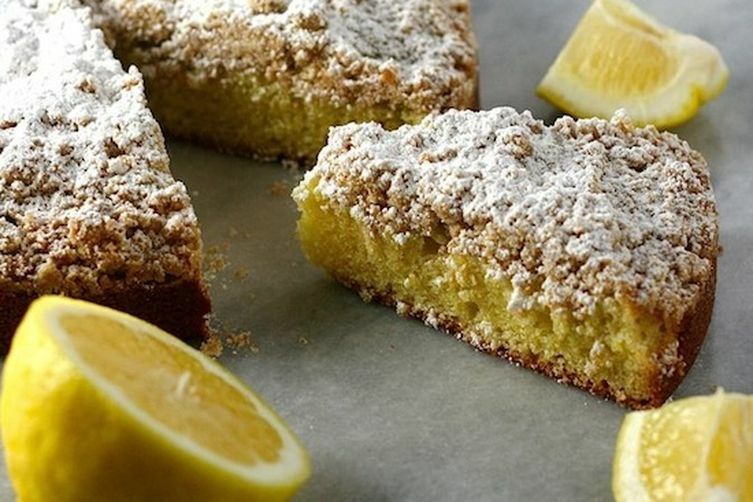 I like to use real olive oil like extra virgin Greek, French or Italian full-bodied stuff, as it perfectly complements the sharpness of the lemon and the aroma of the rosemary – making this cake an absolute winner. Drizzle bottom and sides of cake tin with oil and use your fingers to coat it well. Line bottom with a round of parchment paper and smooth to eliminate air bubbles. Generously sprinkle pan with sugar and tilt to coat in an even layer and tap out excess. Whisk plain flour, almond flour, baking powder, baking soda, and salt in a medium bowl to combine well – so there are no lumps. Next mix the lemon juice and vanilla in a small bowl. Whisk thoroughly in a large bowl the eggs, lemon zest, and sugar until fluffy. Keep on whisking and gently add the olive oil until incorporated and mixture is even thicker. Next add the dry ingredients (flour, ground almonds, baking soda, baking powder, rosemary and salt) in 3 additions – fold batter several times with a large rubber spatula, making sure to scrape the bottom and sides of bowl. Scrape batter into prepared pan, smooth top, and sprinkle with a little sugar – this will help the crust become perfectly crispy. Place cake in oven and bake for 40-50 minutes until top is golden brown, centre is firm to the touch, and a tester inserted into the centre comes out clean, 40–50 minutes. Transfer pan to a wire rack and let cake cool in pan 15 minutes. Poke holes all over top of cake with a toothpick or skewer and then drizzle the remaining 2 tbsp of oil letting it soak in. Remove the cake from the tin and place on a rack to let it cool completely. NB. For the best flavour, wrap cake in plastic and let sit at room temperature at least a day before serving.